This has been a busy week for the chemists studying with us as it brings the culmination of the hard work on their research projects. The third years have defended their submitted work in oral viva voce examinations in tropical conditions with the nice weather we’ve been having. A good performance by the students and a chance to really delve into the details of their research. All that was missing were the margharitas and sun loungers, which may have calmed a few nerves. Our M level students for MChem and MRes have been presenting their research in the chemistry journal club and answering questions from the audience. 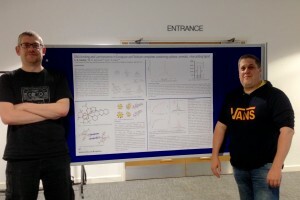 Our MChem has also been presenting a poster of research with further questioning from the assessors, so a very busy week indeed. This entry was posted in Uncategorized by Alison Willows. Bookmark the permalink.